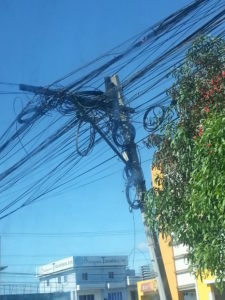 I was interested in the power grid while I was in the Philippines. I saw so many wires on a pole and crisscrossing the street, it almost looked like the early days of telephone in the USA when businesses had a dedicated line from the phone company to their business. In the rural areas, I was concerned because in some places the wires were so low that a person of my average height could easily reach them. In the towns it was amazing. I am not sure how all the power and other utility lines keep from shorting out. Here is a picture I took while on the bus going from one terminal to another at the airport in Manila. Another area that interested me was the water supply. In the village, there is a municipal water system that is used when water is available. It is often not available during parts of the year and should not be considered safe drinking water as several of the children have had to be treated for waterborne parasites. However, that is not what interested me. The water supply appeared to be a form of what we call Pex tubing here in the states. It is buried so shallow that during rains, it often becomes uncovered in places. I realize that they do not have to deal with frost but I would have thought it would helped to protect it more if it was deeper. Everywhere I go, I learn new ways of doing things.